While the water heats and the couscous cooks, prepare the seafood. While the fish cooks, prepare the date-apple salad. Pat the scallops dry with a paper towel; season lightly with salt. In a large frying pan over high heat, warm 2 to 3 teaspoons oil until hot but not smoking. Working in batches if needed, add the scallops and cook without turning until golden brown on one side and starting to turn opaque, 2 to 4 minutes. Turn and continue cooking for about 30 seconds for translucent or 1 to 2 minutes for opaque. Transfer to a plate. Add more oil between batches if needed. While the scallops cook, prepare the date-apple salad. Trim the ends from the celery; thinly slice the celery on the diagonal. Cut the apple lengthwise into quarters and cut away the core. Cut the fruit into ¼-inch-thick slices. Pull the dates away from their pits; thinly slice the dates. Set aside half the feta for the couscous. In a medium bowl, toss together the celery, apple, dates, sherry vinaigrette base, half the feta, and 2 teaspoons [4 tsp] oil. Season to taste with salt and pepper. Cut the lemon into wedges for garnish. To the pot with the couscous, add the spinach and remaining feta and toss to combine. Season to taste with salt and pepper. Transfer the seafood and couscous to individual plates. Serve the date-apple salad and lemon wedges on the side. Pull the dates away from their pits. 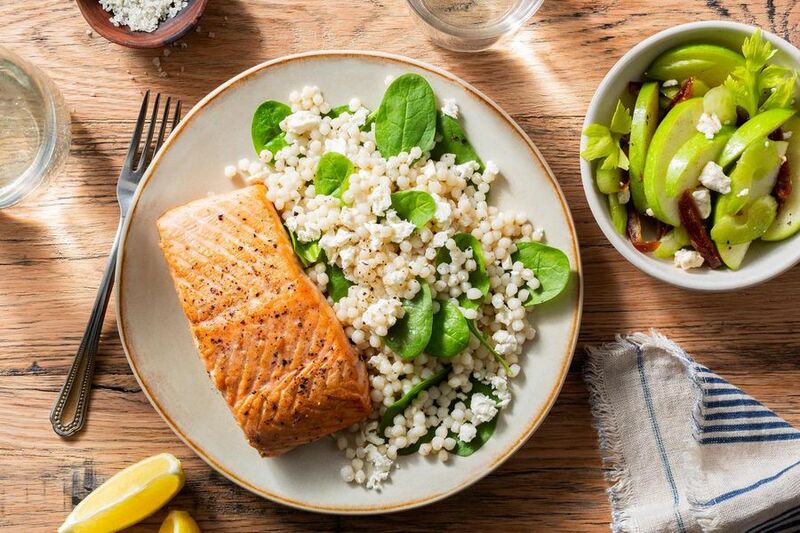 Light, healthy, yet hearty, this fish dish is a surefire crowd-pleaser, with wild-caught seafood and a side of chewy pearl couscous tossed with greens and salty bits of feta. Pearl couscous, also known as Israeli couscous, was developed in the 1950s in Israel as a wheat-based alternative during a rice shortage. It has a wonderfully nutty taste and chewy texture and absorbs the flavors of whatever seasonings it’s served with, making it one of our favorite starches. Calories: 680, Protein: 37g (74% DV), Fiber: 9g (36% DV), Total Fat: 24g (37% DV), Monounsaturated Fat: 16g, Polyunsaturated Fat: 2.5g, Saturated Fat: 5g (25% DV), Cholesterol: 115mg (38% DV), Sodium: 280mg (12% DV), Carbohydrates: 79g (26% DV), Total Sugars: 43g, Added Sugars: 3g (6% DV).